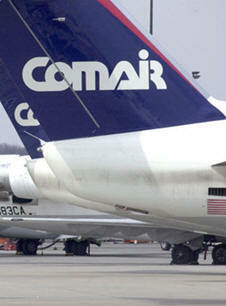 July 28, 2012 - On Friday Delta Air Lines announced its subsidiary, Comair, Inc. will cease operations after Sept. 29, 2012. The carrier is headquartered on the grounds of Cincinnati-Northern Kentucky International Airport. "While regional flying has and will remain a key component of Delta's network, customer expectations and the unit costs of regional flying have evolved. In response, Delta recently announced its plans to reduce the total number of regional jets in its network while adding more mainline flying. This includes reducing the number of 50-seat regional jets from nearly 350 aircraft to 125 or fewer in the upcoming years. As a result of this reduction and changes to its customer-focused business strategy, Delta has made the difficult decision to cease Comair's operations." Ryan Gumm, President of Comair, communicated Delta's decision to Comair employees in a memo, the full text of which is included. The discontinuation of Comair's operations will not result in any significant changes to Delta's network, which has enough flexibility to accommodate these changes. Currently, Comair accounts for approximately one percent of Delta's network capacity. There will be no disruption to customers and no significant adjustments to Delta's flight schedule or locations served. All customers who travel on the Delta network, whether on Delta Connection flights or mainline aircraft, can continue to make travel plans with Delta as they have in the past. Cincinnati will continue to be an important market in Delta's worldwide network. Over the past several years, working with community leaders, Delta has right-sized capacity at Cincinnati to better match service to local passenger demand. Cincinnati is now a profitable market for Delta and the city continues to enjoy over 120 peak daily flights, with non-stop service to 49 destinations. No reductions in the number of Delta flights are planned at Cincinnati as a result of this decision. Today, I am writing to let you know that Delta has made the difficult decision to cease Comair's operations after September 29, 2012. Delta recently announced its intent to reduce the overall number of 50-seat regional jets in its network from nearly 350 to 125 or fewer in light of the significant changes in the economic and competitive conditions in the airline industry. We believed this announcement would have a negative impact on Comair because we operate some of the oldest 50-seat aircraft in the Delta Connection fleet, which also have the highest unit cost per flight hour. And, in fact, Delta has decided to remove the remaining 16 Comair 50-seaters from the Delta network, leaving Comair with only 28 aircraft in scheduled service. This further reduction of Comair's active fleet will only create higher unit costs, which equates to a business model that is no longer sustainable in this competitive regional environment. I understand that today's news is very difficult and raises many questions for you and your family. Human Resources is prepared to directly assist you during this time. They will post a memo and other documents on the Human Resources Epic page to keep you informed of the assistance available and to help answer many of your questions. We will also have staff available over the weekend to answer questions if needed. If after reviewing the information on Epic you have any additional questions or concerns, please do not hesitate to reach out to your departmental leadership as well. The discontinuation of Comair's operations is in no way a failure or a reflection of your work – it is an unfortunate necessity due to the economic limitations of our aging aircraft, cost structure, the long-term outlook for 50-seat aircraft, and our challenging industry and economy. The quality of our operations has continued to be outstanding during our lengthy restructuring efforts, and I am honored to have had the opportunity to lead such a committed team. I am asking that each of you recognize the importance of remaining focused on safety and the job at hand as we continue operations throughout the wind-down period. Your continued commitment and your dedication to a safe and reliable operation is a testament to the professional team we have built here at Comair. “Instead of utilizing its own feeder carrier, Delta chose to cannibalize itself in its continual cost-cutting pursuit,” said President of District 142 Tom Higginbotham. “With Delta, it’s not about people; it’s about padding their profit margins.” IAM District 142 has vowed to push for severance, job opportunities, flight benefits and reimbursement of unused vacation and sick leave. Comair IAM members will also have access to the IAM’s Community and Members Service Committees to provide transition assistance.